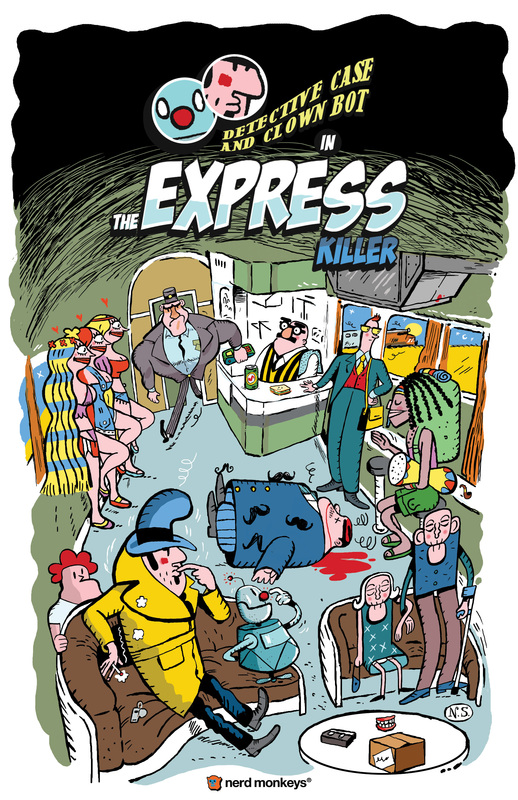 The Express Killer is the sequel to Murder in the Hotel Lisbon. It follows the classic point and click adventure formula from the 80’s and 90’s. The game itself runs at a native resolution of 256×192, the same resolution used by the old ZX Spectrum 48k and the Nintendo DS. The Case and Bot duo was always a personal project. Directed and written by me this is the type of game I always wanted to do but never really had the opportunity to do so. The amazing team that gathered to produced this game was absolutely fantastic and I could have never done it without these guys. Just like the original, The Express Killer is full of references, stupid jokes and crazy moments. Some were written to be that way while others just came to us along the production. Here are just a few curiosities. 1 – Just like in the first game, the team that made the game returns and is present at the Train Station waiting for a train. 2 – The rock band that asks for money at the Train Station are an actual real live band called “Gordo e os Indecentes”. They are also the ones who play the credits end song “Justin Case. 3 – The character that sits on the train called Brick M. Stonewood is actually the lead character for the upcoming game Starr Mazer. This cross over goes both ways as Detective Case will also appear in Starr Mazer for the GREATEST CROSS-OVER EVER!